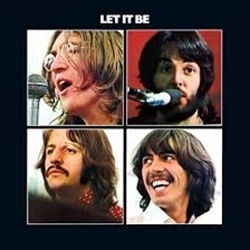 The Beatles, “Two of Us” from Let It Be (1970): Deep Beatles . Beatles Radio: The Beatles, Solos, Covers, Birthdays, News The Fab 4 and More! Paul McCartney may have intended the Beatles’ “Two of Us” to celebrate his blooming romance with Linda Eastman, but those words also summarized his friendship and creative partnership with John Lennon. Though recorded during the Beatles’ turbulent Get Back sessions, “Two of Us” remains a tender ode to love and friendship, although McCartney surprisingly intended the song for someone else to record. As McCartney told biographer Barry Miles, he and Eastman would enjoy going for country drives together, often getting lost on purpose. Once she moved permanently to London, the couple would frequently bundle McCartney’s sheepdog Martha into the car, pick up a picnic lunch, and drive out to a remote rural area. Eastman would then take photographs as McCartney strummed his guitar. Although “Two of Us” was clearly a personal song for McCartney, he initially offered it to another group. Mortimer, a New York trio being considered for Apple Records, recorded the then-titled “On Our Way Home,” intended to be their debut single in June 1969. Even though they recorded other Peter Asher-produced tracks as well, Mortimer was soon ejected from the label — a victim of the Beatles’ then-manager Allen Klein. The album remained unreleased until 2017, when the PRM Records label finally released their shelved Asher sessions.